The first sign we were caught in a parade was the noise. Our plane had landed at the southern tip of India an hour prior, where we then hired a taxi to take us to the beach 60 km north. Now we approached a village, and above the din of horns and Hindu mantras broadcast from temples came the jaunty dischord of a band warming up. Our car inched slowly through lines of musicians in t-shirts, followed by women in full traditional makeup and jewelry, followed by five elephants, shackled and bedazzled with sequins and silk. The boyfriend and I gaped out the windows, delighted to be stuck in a colourful cacophany after four hours on a plane from Dubai. As we would discover in the next eight days, India’s south-western state of Kerala is noisy, colourful, and charming whether you’re in a parade or not. The adventure had begun. 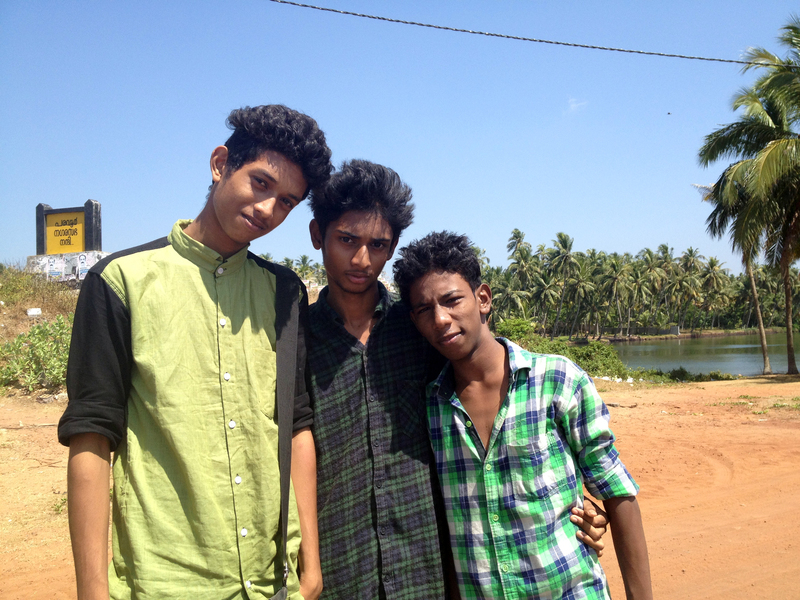 We were en route to Varkala Beach from Thiruvananthapuram (pronounciation mastered, thank you very much). It was easy to rent a car and driver at the prepaid taxi stand, and a 1.5-hour ride cost only 1,470 rupees (about $23). 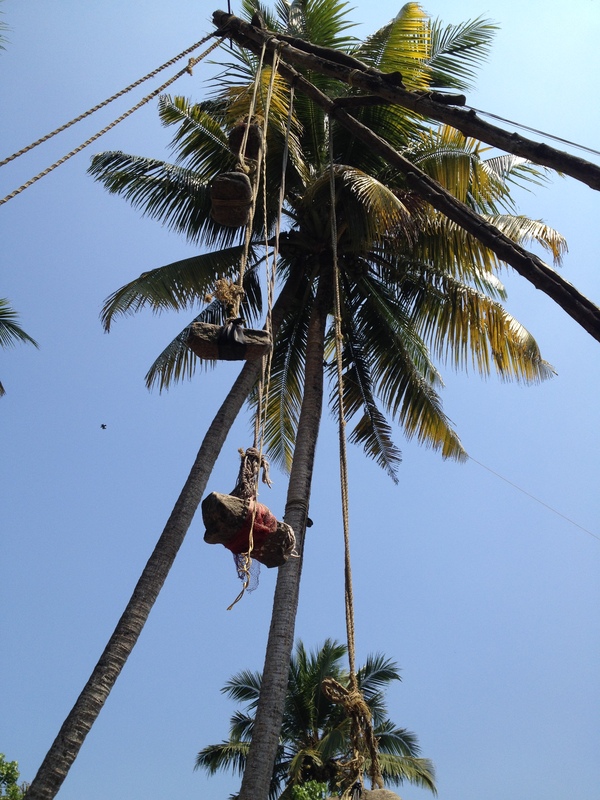 Easy, cheap, but not exactly relaxing after I discovered India’s dirty little secret: there are no road rules. Or, if there are, they aren’t followed and the roads are paved with peril. Sometimes I found it comforting to not look out the windshield at all, given the near-misses as we swerved around auto-rickshaws and families on motorbikes, or joined a maze of vehicles swarming at an intersection like protozoa in a petri dish…and always honking, honking, honking. The horn seems as critical here as the turn signal; certainly it’s used more often. Of greatest concern to me were the many pedestrians just hanging out in the road, chatting or resting with their fruit carts. After sunset our car tore up a little road to the south end of North Cliffs, Varkala Beach. To our left were the South Cliffs, home to a famous temple and a beach where funeral services take place. To our right was a long path along the clifftop. Straight in front of us? The glorious Arabian Sea. We grabbed our bags and headed right, to find our hotel along the clifftop. 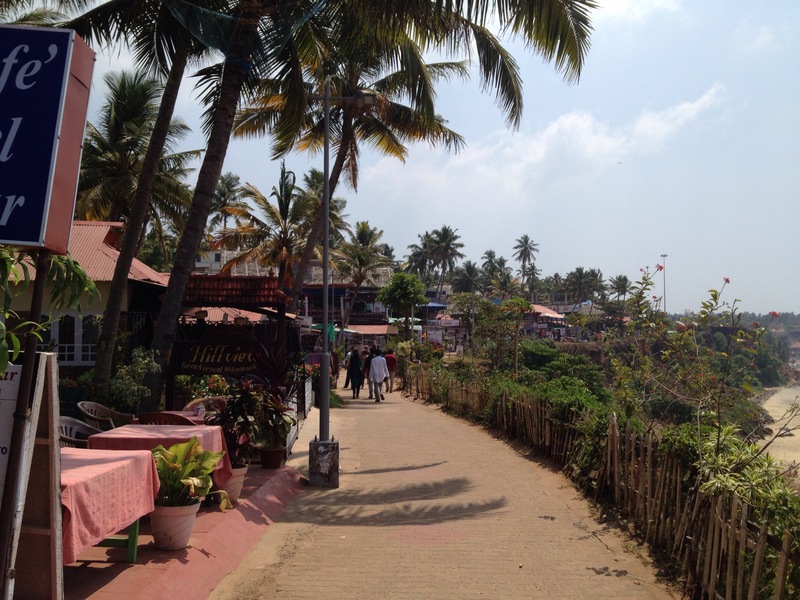 Here is a special place in the world, despite Varkala’s commercial aspect, with its many shops and restaurants lining the cliffside path. Step carefully down one of the several crumbling staircases to the beach, and you have your own slice of the Malabar Coast; it’s not yours alone, but it’s breathtaking. Wild dogs roam around looking for hand-outs and old women sell coconuts and pineapple…they’re all part of the charm. 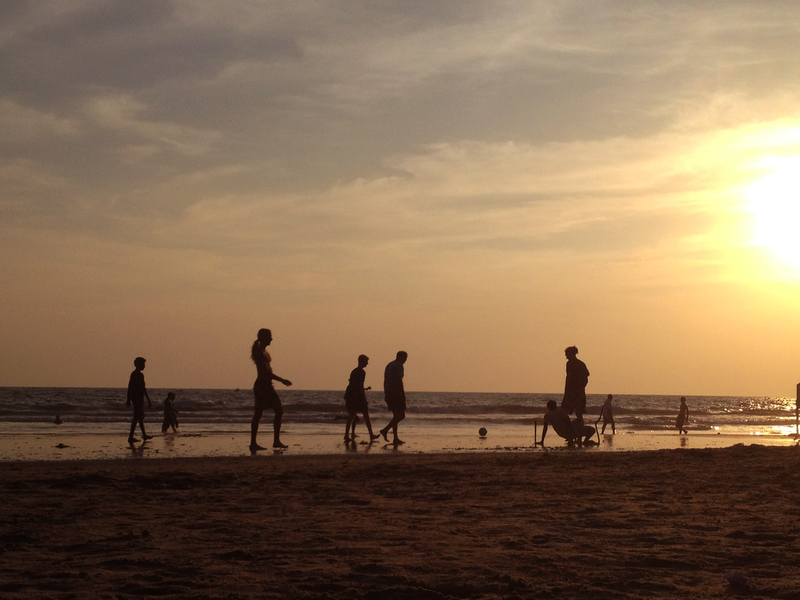 At sundown the locals play football on the wet sand made orange by the sky. Tourists seem to be in equal numbers to the locals who work the businesses up on the clifftop, but they intermingle happily. We made more friends with locals than fellow tourists before departing three days later. At first we were taken aback by how friendly the Indians were, chatting with us and holding our hands as we spoke. More than that, they just seemed so happy and unafraid to show it. Men walk down the street with their arms around each other. Girls sit together in casual embrace. What a beautiful phenomenon, this happiness! 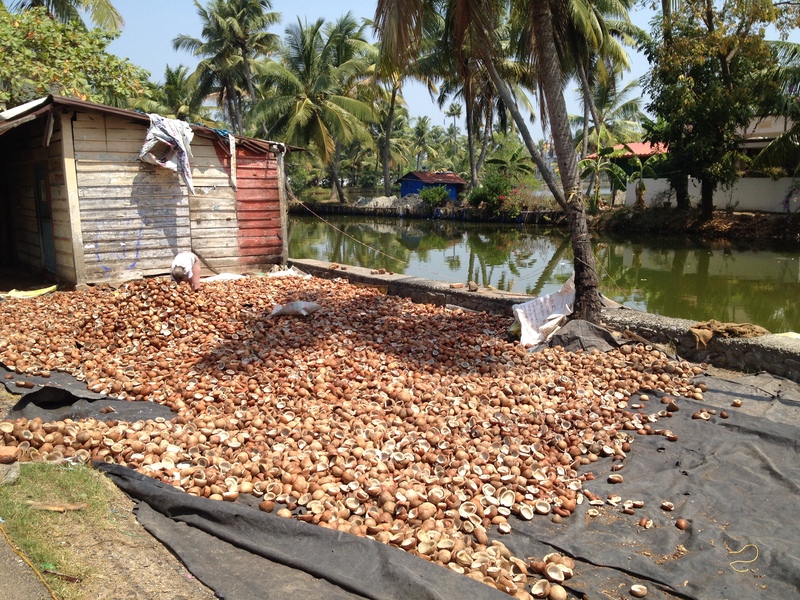 I felt us coming out of our own hardened urban shells the longer we were in Kerala. Our first friend was Ravi, the main man of Blue Moon Cafe, which we discovered midway down the path, having flung our bags into our new home at Bamboo Village and peeled off several layers. We had our first magical meal at Blue Moon that night, discovering how light and complex an authentic Indian curry can be. Mine was mild, but I gained confidence when ordering over the next week, as I came to realise Indian chefs aren’t out to smother me with spicy heat; the strength lies in the alchemy of spice combinations and fresh, fragrant ingredients. A few mustard seeds, some grated coconut, the tang of kaffir lime leaves…these simple additions make Kerala’s cuisine the best Indian food I could imagine. And if you haven’t yet discovered the fluffy heaven of a parotta, you have the luxury of continuing to believe naan will do just fine. This girl knows too much. 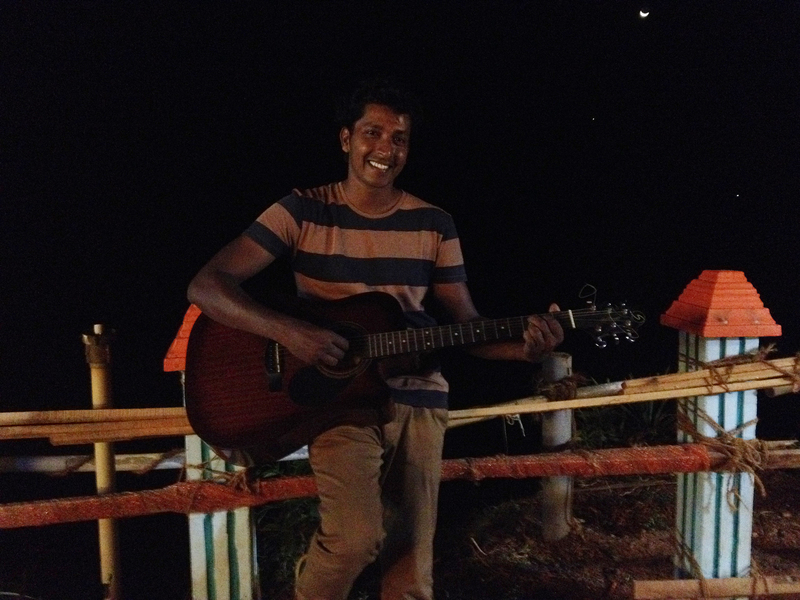 Ravi lured us back to his restaurant with respectful insistence on at least two occasions. One was for a traditional Kerala-style breakfast, which he personally started preparing for us at 8 am, in anticipation of our 9 am arrival. Three appams of doughy rice flour were laid on a plate like snowy white pancakes. 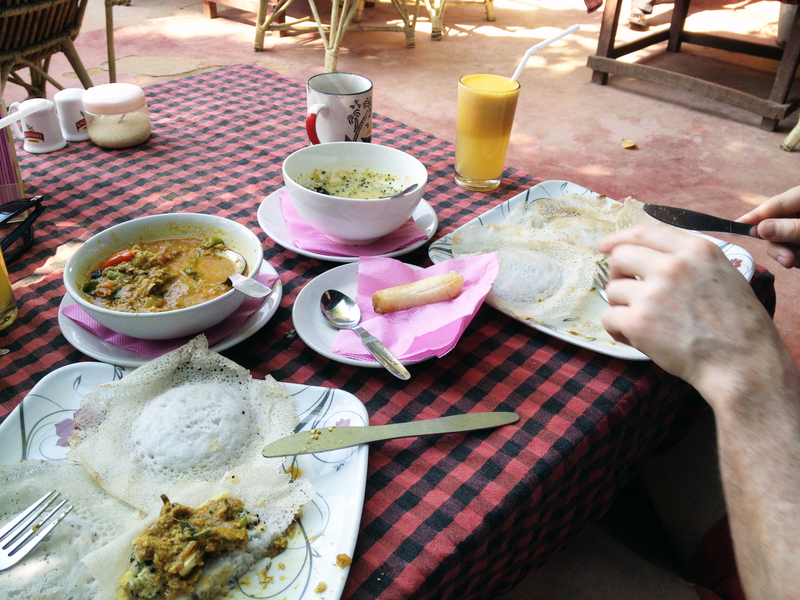 We ladeled a spoonful from each of two bowls onto an appam, and ignored Indian convention by tearing in with a knife and fork. The vegetable masala was buoyed by the lighter coconut broth. We had a few masala dishes while in Kerala, and came to learn there are subtle differences in flavour and spice level, although you won’t know which you’re getting until it’s in your mouth. Masala is the general term for spiced, and can apply to even a chai tea. That breakfast is burned on my brain – us chewing rapturously on the sunny terrace of Blue Moon while Ravi shared pictures of his family and stories from 15 years of work in Varkala. The first two nights we roughed it a bit in an adequate bungalow at Bamboo Village; we didn’t miss hot showers (it was 34°C outside), but it wasn’t as clean as we’d hoped. After two days we moved to a lovely big room at Blue Marine Resort. Our room was in the main building, set back across a courtyard. Our shared first-floor balcony overlooked the outdoor restaurant/bar at the front, by the cliff path, which perfectly framed the sunset over the sea. The guys who work here, Vinod and Aji, are beyond friendly; they gave us advice and served us beers late into the night, playing guitar and singing Beatles songs with a Malayam accent. A word here about costs: if you can get yourself to this part of the world, you can live cheaply for about five times as long as you might on other trips. Rooms can be rented for as little as 800 rupees ($12, as at Blue Marine) or as “much” as 4,000–5,000 rupees ($63–$79). Dinner will often cost as little as 600 rupees ($9.50) for two; ours were usually about 1,300 rupees ($20) with four 22-ounce Kingfisher beers. We bought leather shoes for the equivalent of $8 at one of the cliffside shops. You’re expected to haggle for a bargain, but I couldn’t bring myself to most of the time; shopkeepers work such long hours for so little profit, and I felt suddenly wealthy for the first time in my life. 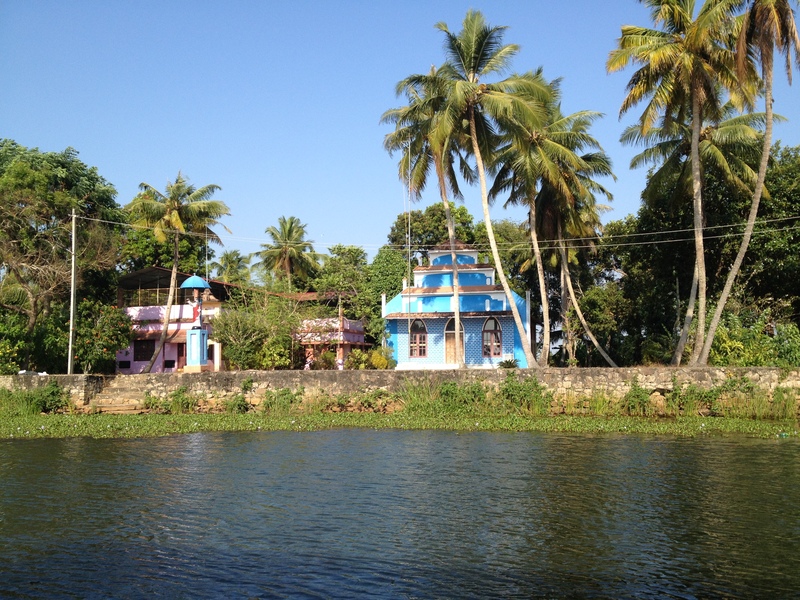 We left Varkala with reluctance, headed north via taxi to Quillom, where we caught the 10 am public tourist ferry through Kerala’s backwaters to Alappuzha (Alleppey). 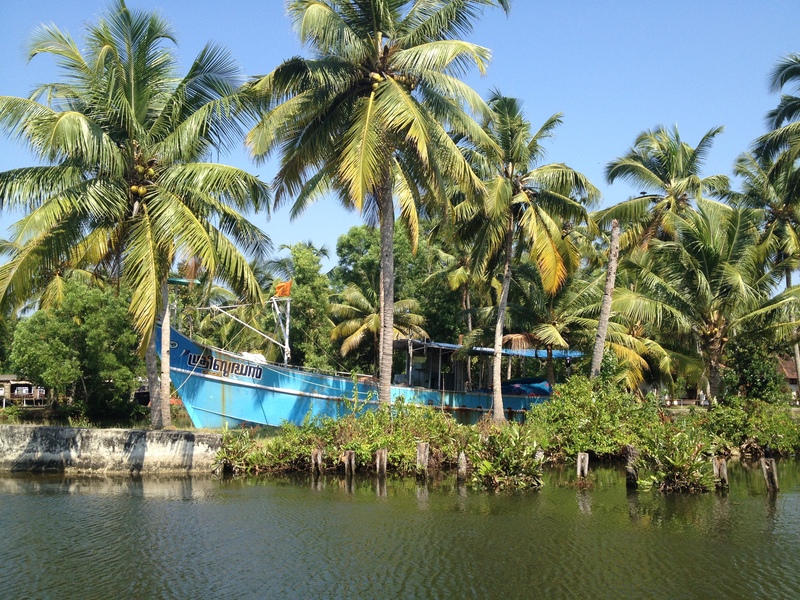 The 1,500-km backwaters network is made up of freshwater and saltwater canals, lakes and lagoons. There’s a variety of ways to traverse them, but at this time of year (February), they weren’t jammed with boats, as I’d feared. Our ferry service ran once daily and carried only about 20 passengers, but had a capacity for triple that. The 400-rupee ($6!!!) eight-hour ferry ride suited us well, although the houseboats looked like an inviting way to travel if you were with a group and could spread the costs. 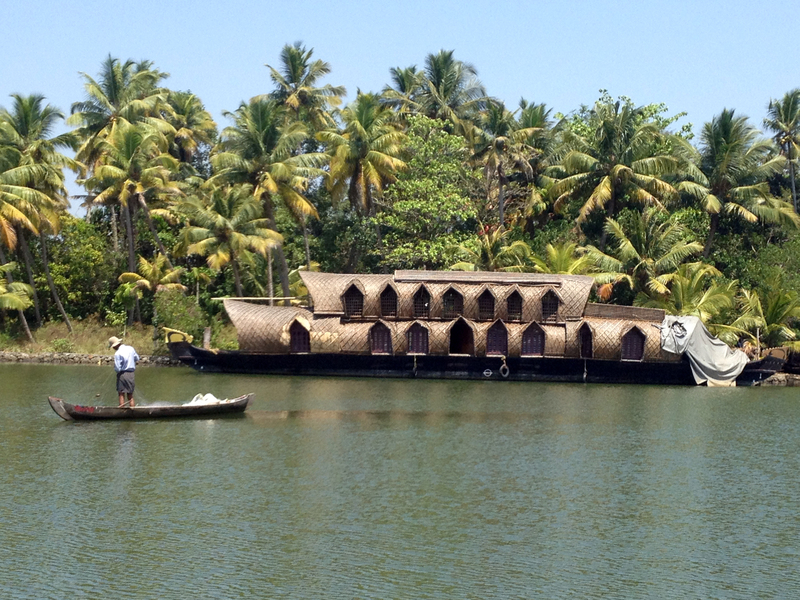 A Canadian traveller told us he had spent a night on a houseboat with only his companion, the chef and the driver. He had dined under the stars and slept comfortably on a bed inside. Motoring slowly through the backwaters is a sublime way to glimpse rural India: women washing pots on the banks, families bathing and splashing each other, Hindus walking to temple along riverside paths, cows and goats grazing beside laundry drying in the sun. Hindi chants echoed off the banks as we drifted by houses as vibrant as Easter eggs. Many people stopped in their tracks as they heard our motor approaching, broad smiles breaking out and frenzied hands waving. I was beginning to discover Indians’ interest in me as a foreigner. 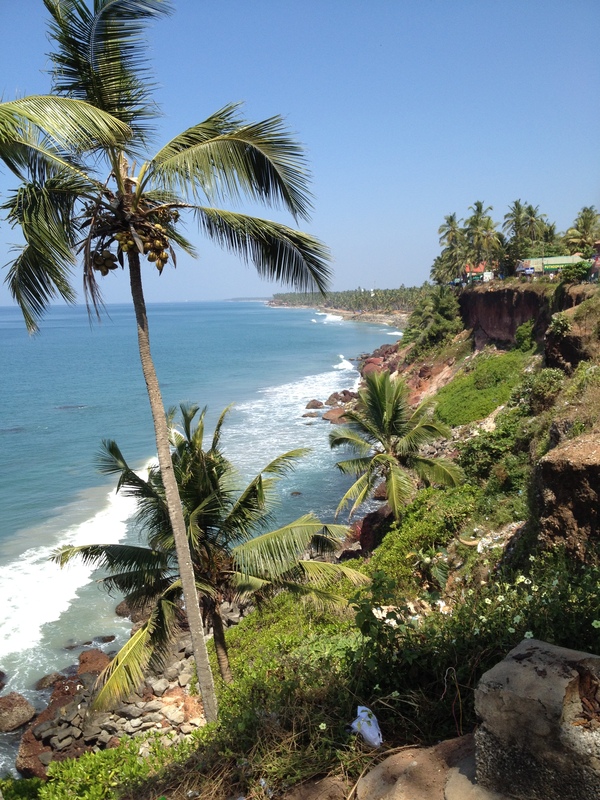 Varkala has a plethora of white tourists, but we were entering a part of Kerala that saw mainly Indian tourists; I had become the object of curiousity. We reached Alleppey at sundown, and a rickshaw driver engaged us immediately after we disembarked, thrusting a hotel business card into my hands. Why not? It was a gamble, but we felt no obligation and had no other prospects yet. The Gowri turned out to be a neat little estate of cottages, and we chose a quirky treehouse room. From our perch among the jackfruit trees, you could hear only marginal nighttime street noise but — quite distinctly — morning mantras at the temple next door. I love such involuntary wake-up calls in a foreign country — the strange harmony of human voices and weird bird calls mixed with rickshaws tearing through the streets, reminding me before I open my eyes that I am deep in the heart of no place like home. Another of the hotel’s rickshaw drivers, Kabir, offered to take us to the city of Cochin, 60 km north. We had been thinking of taking a taxi, but he promised to follow small coastal roads and make interesting stops. Saying yes changed my life a little bit. It took twice as long as a taxi ride, but we took in ten times as many sights, sounds and smells in our open-air rickshaw. Twenty minutes on the road, Kabir pulled over by a brick wall and told us to follow him. Beyond the wall we found a yarn-dyeing plant. We stepped delicately around huge vats of dye and piles of fluffy yarn drying in the front yard. 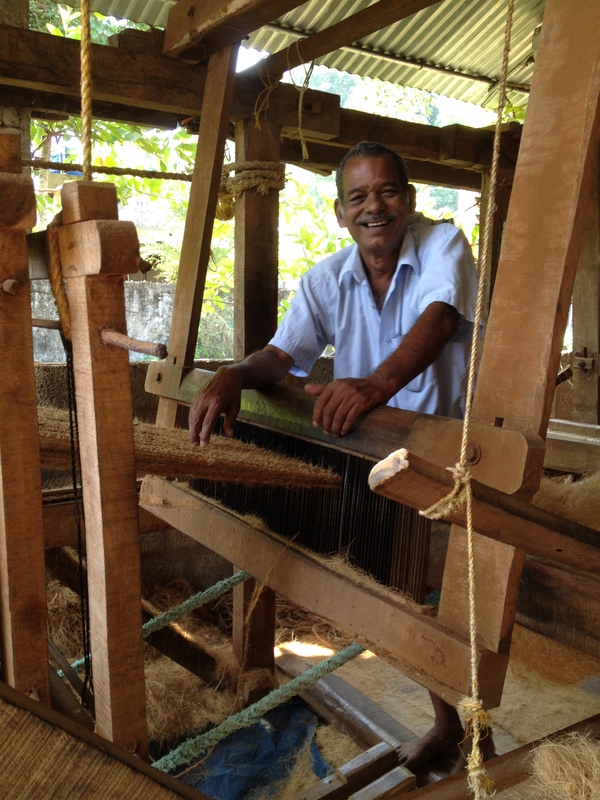 Kabir led us to a roofed area where two men were making colourful rugs on old wooden looms. Try getting that out of an Uber ride. 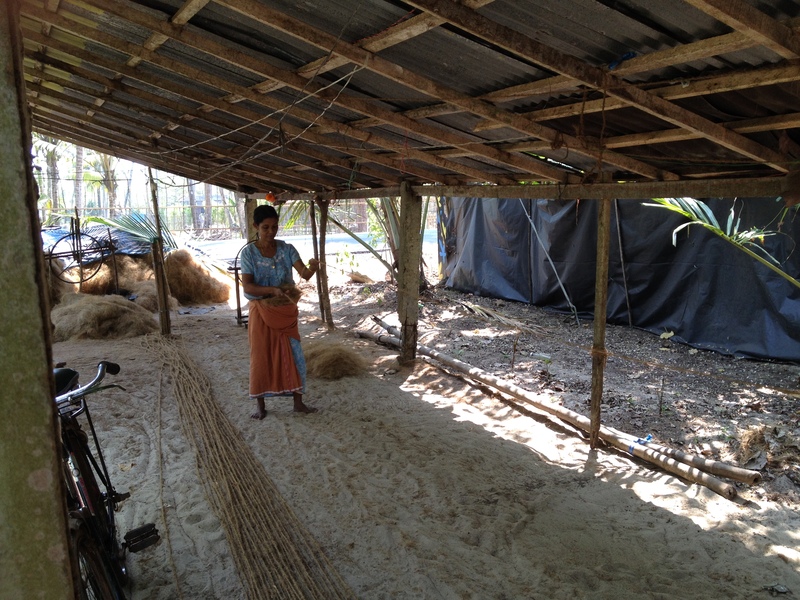 At the next stop we met a woman at a mat “factory” fashioning rope out of coconut husks, binding their threads together in long strands being twisted by a small machine. She took 20 mincing steps backward, away from the machine as it twisted, charting her course along the sand floor, only to return to the machine and start another strand. I think of her now, still binding filament after filament, in the shade of the corrogated roof, all day long, every day. Two men worked looms behind her, turning her rope into sturdy brown floormats, such as you see outside doors all over America. The primitive machines clacked and creaked as the men worked the gears. Back on the road, we caught glimpses of the sea as we worked our way north. The rickshaw next slowed to a stop outside a coconut oil plant, where a tiny old woman bent over, sorting hundreds of coconut shells in the midday heat. Inside the plant Kabir showed us a huge machine that consumed the coconut meat and spit out pressed oil, which would be bottled and sold for ten times its value to Western markets. Glimpsing all these moments of working life enriched our relationship with India, I think. It feels right to remind oneself of the human effort that goes into creation of the products we use every day in the Western world. This man probably made your doormat. Next Kabir showed us the little-known Marari Beach…the kind you dream about at your desk…with soft, pristine white sand and dogs sleeping in the shade of moored boats. He saw the joy in our eyes and turned to us to ask, “You stay here?” For a brief moment the boyfriend and I could see our whole lives blissfully unfolding if we just…stayed here. 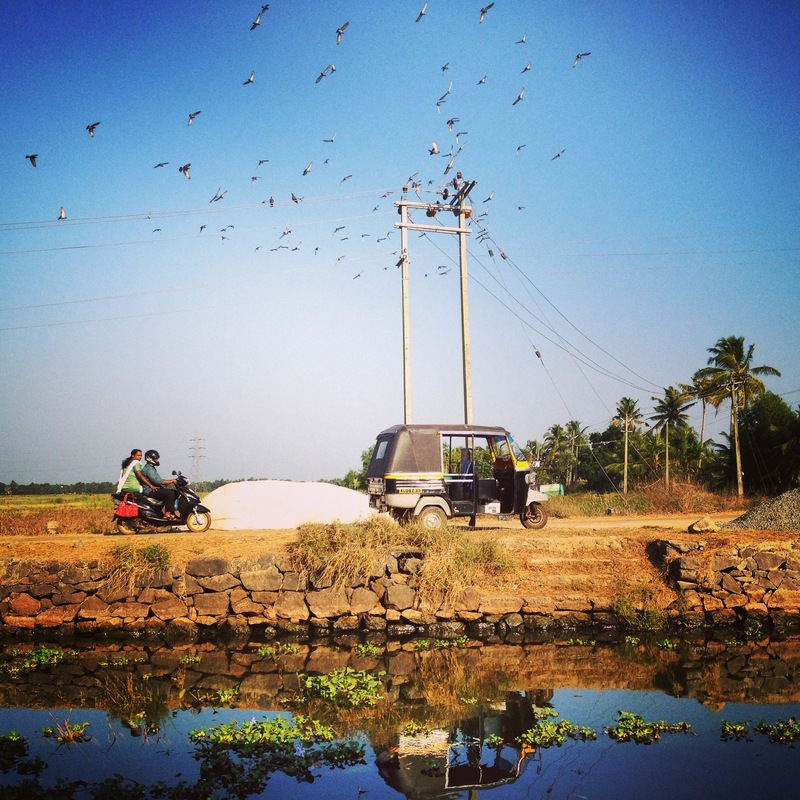 But we’d promised ourselves more than sand on this trip, so it was back into the rickshaw and on to Cochin. 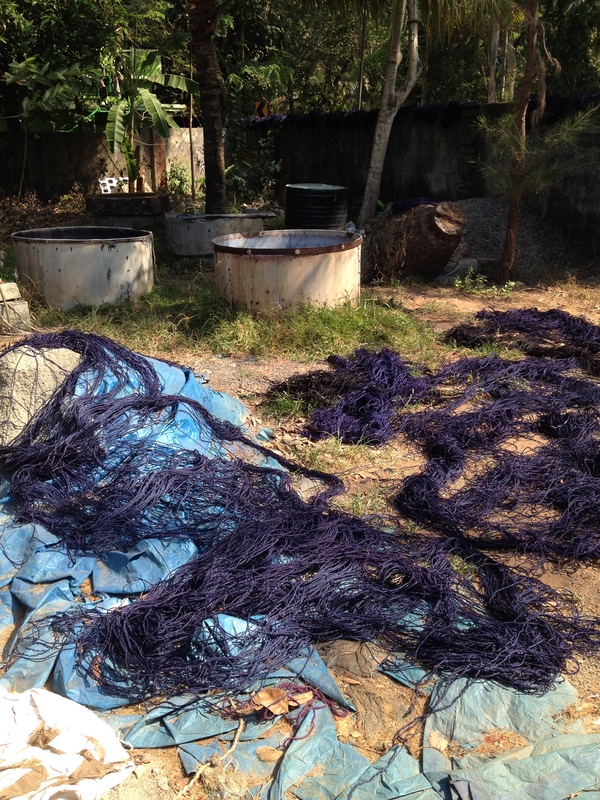 Upon entering the outskirts, we made a final stop, to see up close one of the very large “spider” fishing nets found all around Cochin. 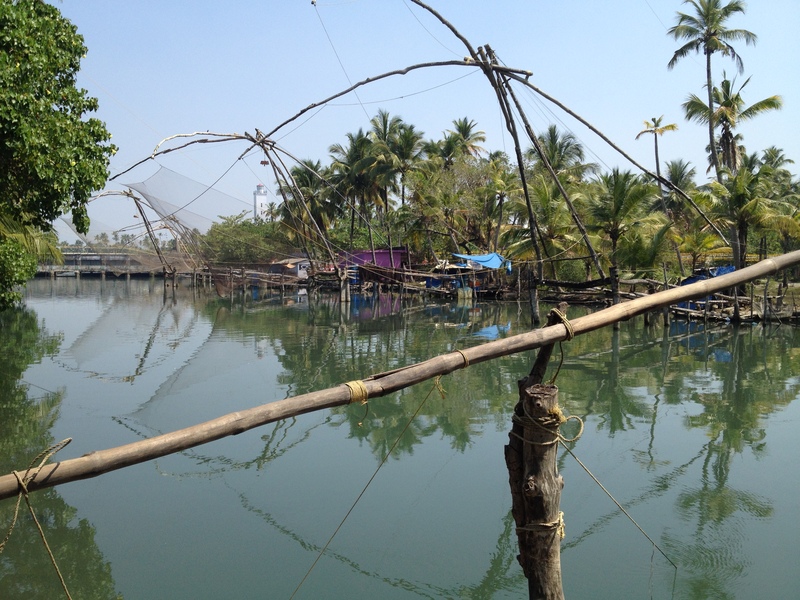 The net is attached to the ends of long wooden poles extended over the water. The fisherman, a short man with high hopes, pulled on weighted ropes tied to the poles, and the net rose from the water, dripping empty disappointment. Back down it sank, in another cycle of ancient labour that repeats itself every day, for endless days. Almost immediately after we said goodbye to Kabir in Cochin, I was plotting our escape. It’s a nice enough little city, with Portuguese colonial architecture and a burgeoning art scene, but I felt stifled as we navigated the burning midday streets of the Fort Cochin neighbourhood, dodging motorbikes and trying to find wifi to explore hotel options. This neighbourhood is on the water, but not the actual waterfront, and the heat is staggering when you’re even a block away from the sea breeze. Plus, as a city kid who doesn’t get enough nature, I felt irritated by the hassle of negotiating a foreign city centre at that moment. With only four days left of our trip, we decided to spend just one day and night in Cochin. There are several homestays in the area, which are rooms in homes where you can experience the food and customs of an Indian family. We opted for a nearby hotel room instead; after a shower and rest, we headed to the centre of Fort Cochin, to find its Tourist Desk. 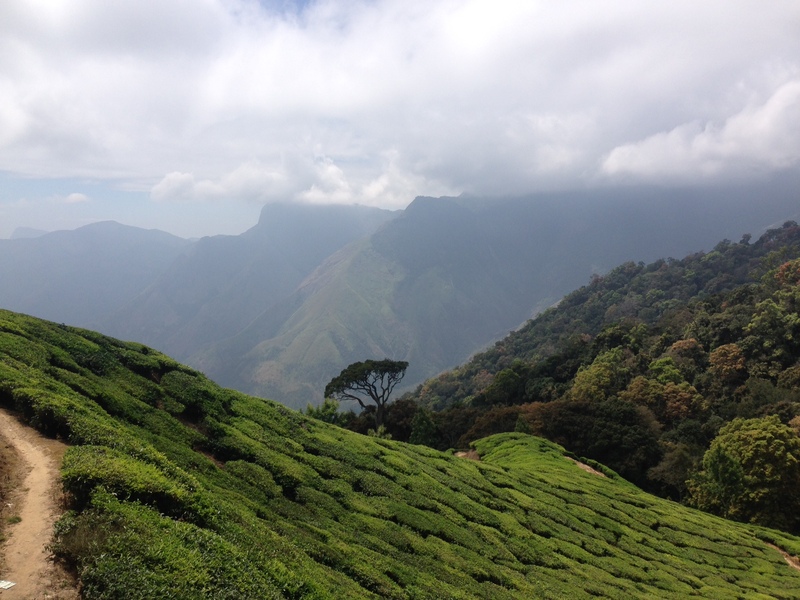 This service offers a two-day, one-night tour to Munnar, in the Cardamom Hills east of Cochin. The hill country is dotted with old estates formerly used by British colonials for a cool mountain respite in the summer. 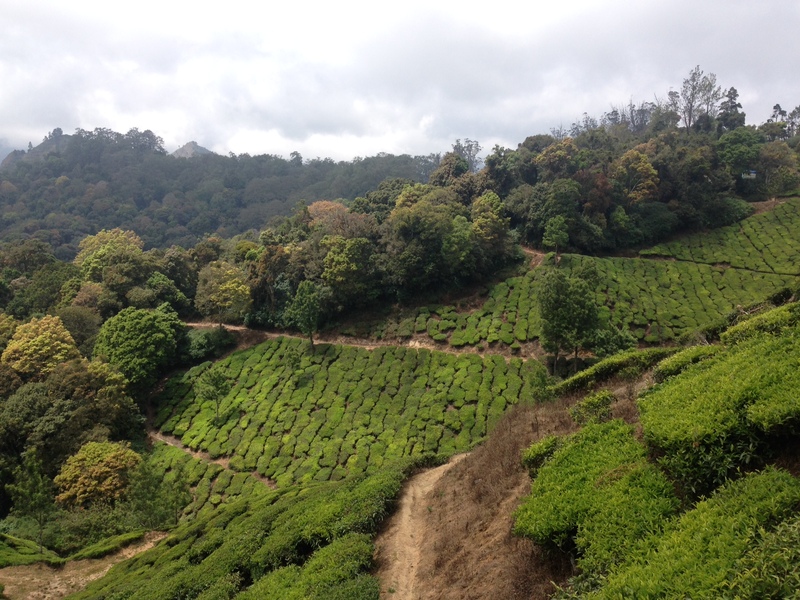 The real draw for us was the tea plantations, having an intense curiousity about where our daily fix comes from. 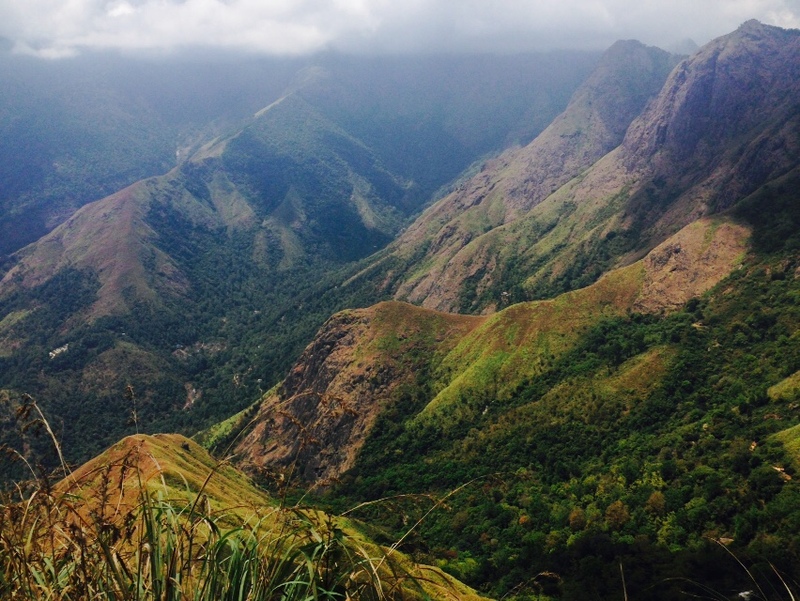 Munnar is only about a four-hour drive from Cochin, but the tour promised many interesting stopping points that would stretch it into almost a full day. Some did prove interesting; others may well have been, if we had known what we were looking at. It turned out our driver spoken very limited English. We pulled up to an elephant camp in Kodanad around 9 am. “Where do these elephants come from?” I asked him. “Yes!” he exclaimed. After a few similar exchanges, I christened myself the unofficial tour guide, reading from our Rough Guide book and educating the other English passenger and a couple from Rajasthan, our travelling companions. To be fair, the Tourist Desk brochure said nothing about a guided tour. But then, it also didn’t advertise a driver with a near-fatal intent to overtake every vehicle he encountered for two days. Nor did it promise a close encounter with the back of an oil tanker that stopped short after we’d been tailing it for two miles. Finally, it failed to describe the exhilaration of careening 60 mph through a highway construction site in near-darkness on our arrival back in Cochin. I had become used to a prolonged sense of terror in rickshaws driving through cities, but this trip in the back of a seatbelt-less SUV on steep roads pretty much drained every drop of relaxation I had soaked up on this vacation. That said, the views from our backseat were incredible. We zipped up the hills through vibrant green tea trees, which clung like a carpet of neat puzzle pieces to the jagged landscape. 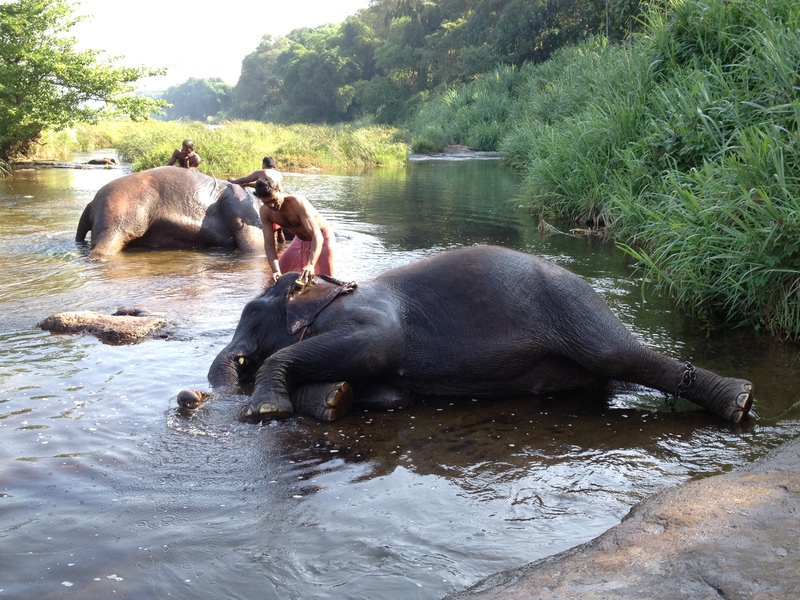 At Kodanadu we had watched five elephants bathed in a river — a twice-daily routine that I don’t fully understand (can’t they clean themselves?) but they seemed to relish. 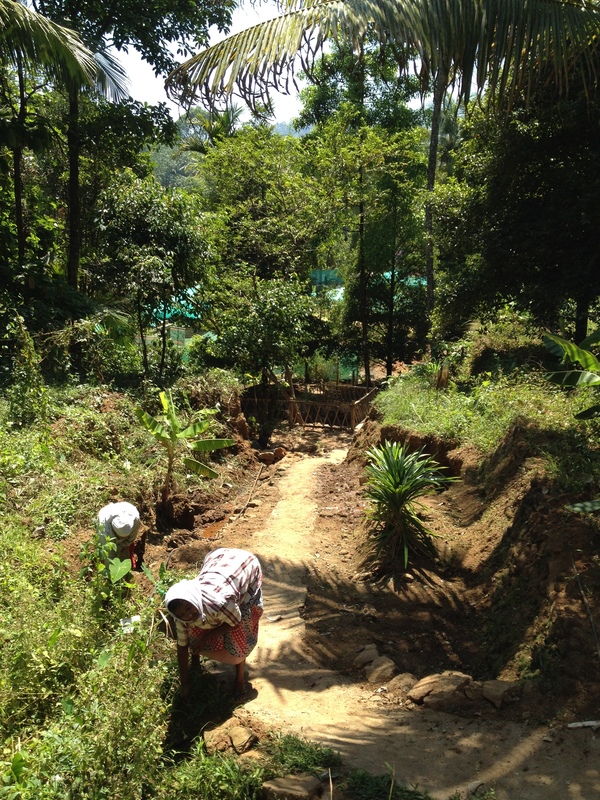 We also stopped at Cheeyappara waterfall, and made an unofficial visit to one of many roadside Ayurvedic spice gardens. But the Munnar Tea Museum was the pinnacle of the day (physical and metaphorical), and we spent a happy hour watching tea leaves being sorted, oxidised and dried, before sampling a couple of brews in the lobby. We stayed that night at a four-room bungalow the Tourist Desk runs in south Munnar, called The British County. Two lovely girls took care of us, prepping the rooms, making us chai and serving us savory meals in a dining room with knock-out views of the Sahya Mountains. The British County has no TV or wifi, so after the sunset we watched regulated fires burning on the far-off mountainside, then read books until we were sleepy. The second day of the tour covered Kundala Lake, Mattupatty Dam and the Top Station; the latter is a 1,700-m-high lookout point on a ridge among the mountaintops of the Western Ghats. 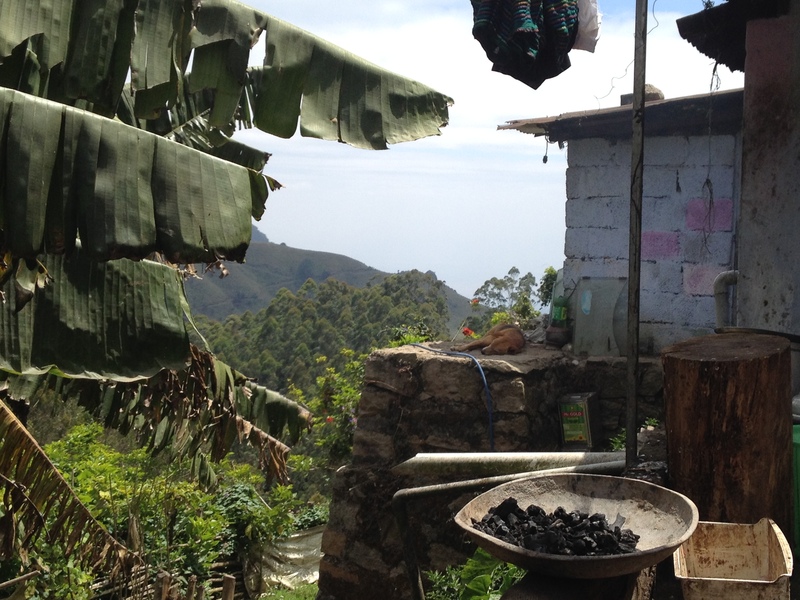 Tea pickers used to bring their leafy loads up to this station for transportation and processing. The visitor who makes the extreme effort to hike steeply down a trail — and then up, to reach the furthest vantage — is richly rewarded. There were 360-degree views of Indian countryside such as I’d never envisioned. So green! So open, wild, and remote! 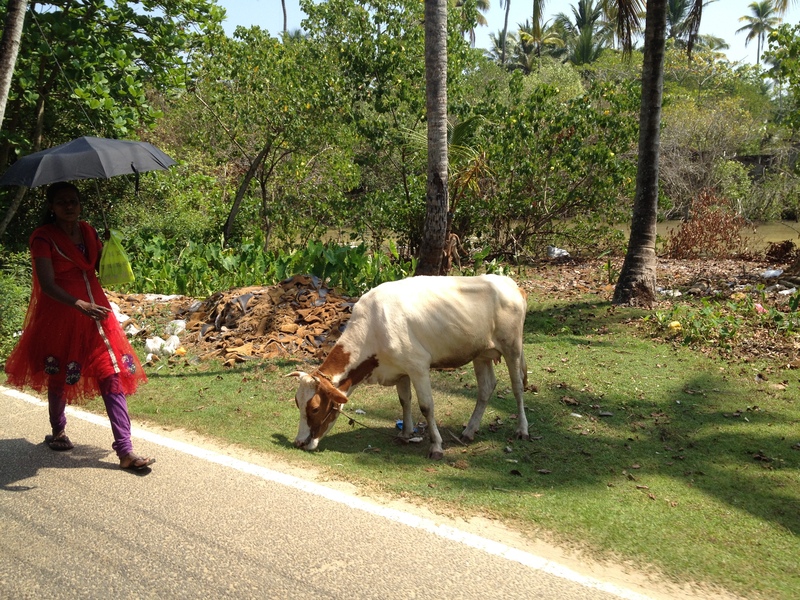 I saw then how Kerala had come to be dubbed “God’s own country”. I snapped the photo above at a rest stop on our tour, charmed by the sleeping dog on the stones. In the bottom of the frame you see an extinguished fire in some kind of basin. This is unusual, in that the fire had obviously been contained: the only evidence of a contained fire I witnessed in India. For days I’d been puzzling over the many random small fires we had passed…on the roadside, behind a restaurant, in front of a house. Turns out they’re burning trash, but the irony is that litter seems to remain a huge problem in India. In other words, I figure there should probably be like 500 times as many fires as we saw, at any given time. Our Indian tour mates thought nothing of tossing an empty cup out the car window, or chucking a wad of paper shoulder-wise into the ravine of a pretty tea plantation. Such seemingly systemic behaviour has resulted in a blight on most of the lovely natural places we visited. Stop the car, gaze at the view, then pan down from any given scenic point: there it is, on the ground below, litter, litter everywhere. After our weekend in hill country, we decided to end the vacation with two days on the beach. 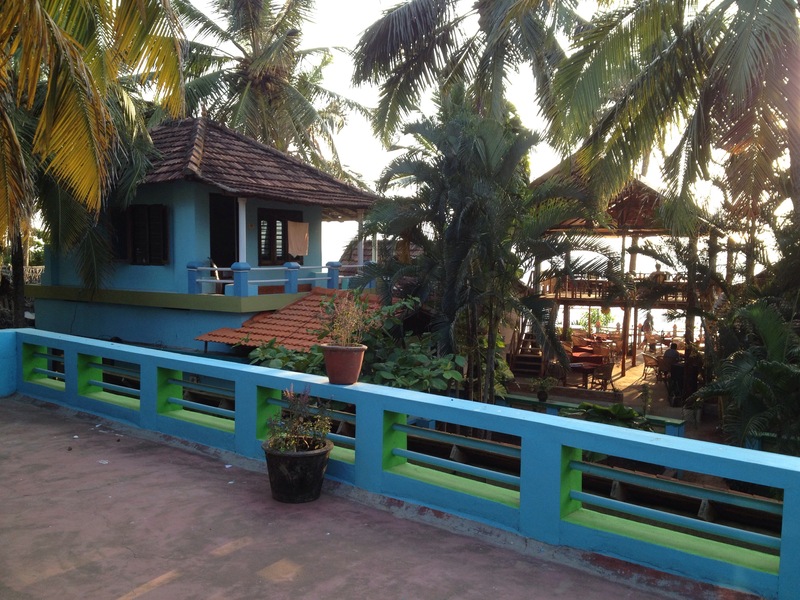 A little-known treasure about 25 km north of Cochin is Cherai Beach. We rickshawed over a bridge and up Vypin Island, arriving at Baywatch Beach Homes. We had booked a standard room on Agoda.com, but the manager insisted on showing us an option to upgrade; this decision turned out to be pretty much a no-brainer, after he showed us the windowless room we had reserved. As he flicked on the sharp flourescent light, a terrified cricket fled underneath the bed. We were used to bare bones, but an oceanfront room with toilet paper seemed like a nice prospect for our final two nights. Our air-conditioned room had patio doors opening onto a broad shared balcony with tables and chairs. Hardly anyone ventured onto the balcony for two days, except the wait staff when we ate our meals in front of our room, the better to view the sunset. Other times we walked downstairs into the open-air dining room, oddly reminiscent of a 1980s skate park. The staff at Baywatch were so nice, and the location so perfect…only a few steps and we were on the beach. It didn’t matter that there weren’t many other restaurant options or bars nearby; the only reason we found to leave the property was to take a short trip into town for some shopping. Cherai Beach stretches for miles but it seemed so pleasantly empty; this was mid-February, and the end of tourist season. A few hotels neighboured ours, but they were sparsely occupied. Most locals didn’t use the beach until the sun fell low in the sky. Those who did appear during the day often wandered our way and stood in groups, mostly of teenage boys, gaping at our white skin and… taking our photos?! I had become accustomed to this on the roads, as boys on motorbikes screeched to a halt, wanting a “selfie”. Driving through villages, I’d been starting to feel like Princess Di as people caught sight of me in a rickshaw and began their frenzied waving, nudging their friends. But in my swimsuit, trying to find peace in this beautiful stretch of beach, I could never shake the discomfort at being stared at. I couldn’t even come to terms with their wanting photographs of me, despite the boyfriend’s assurances that they’re just fascinated and want to show people they have Western “friends”. I think I’d need an extra week to get past this odd aspect of Indian beach culture, but it didn’t taint my joy at playing in gentle waves and taking long morning walks. I’m back in the London winter now, watching my tan fade to freckles. A vibrant slideshow of memories plays in my head as I stare at the map of South India on our kitchen wall. The area we travelled, 375 km from Thiravananthupuram to Calicutt, looks such a tiny part of India. There are so many varied experiences one can have on such a massive subcontinent, and mine ended up surprising me; what I saw seems so markedly different to the India I had heard about, all dusty city streets and poverty. Kerala has both, but so much more. Mine is an India of smiling faces, balmy ocean scenes and colour everywhere. I might stay away forever to preserve it that way. 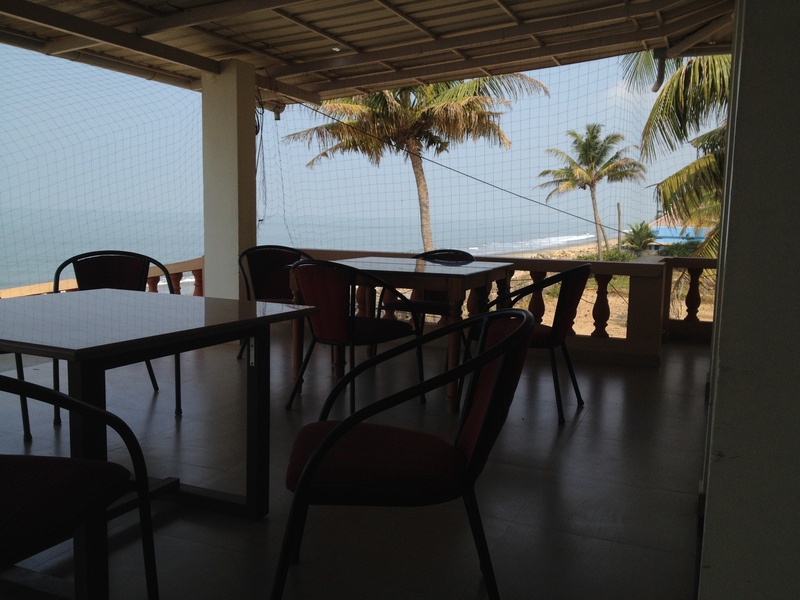 This entry was posted in Travel and tagged Alleppey, backwaters, Blue Marine resort, Blue Moon cafe, Cochin, Gowri, Kerala, Munnar, North Cliffs, South India, tea trees, Varkala, Varkala Beach by aquixie. Bookmark the permalink.